You're talking years ago now, when the kids were little, in the 1970's, bakers' were on strike. We had to bake our own bread, it wasn't too bad, well the kids ate it. Can't remember how we did it. I don't think we got a recipe, somebody told us you have to have the yeast and we did it on the off chance. All we did was got yeast and the flour. I can't remember, only did it a couple of times because it wasn't for long. We had no choice, it was in the bakers' strike. It was nice, it was before, well now they've got them bread makers. Somebody just told us how to do it and we just did it, to feed the kids. I remember we use to go to the bakery on the corner and buy dough. Me Mum would make dumplings with it, she'd cut a piece off and roll it up and put it in boiling water. When it was done you'd break it open and put golden syrup inside. That was pudding! You couldn't do it now because there's no where to get half baked bread. We use to get bread delivered and if the top was a bit burnt on top the driver would say 'It's got a bit of sun that one!'. I grew up in Wales and we would have Bara Brith at a funeral with tea and butter. We had the same thing 20 years ago when my farther died. Both my mother and my grand mother made their own bread. My mother would make bara brith every week, my other grand mother would make it on special ocassions . We use to have chunks of bread and oatcakes (not like the ones you get round here, more like the scottish ones) you'd poor beef dripping over it and that would be breakfast. My mother is 86 and still makes the oatcakes now. The kneading is very therapeutic. I like to watch people do it, rather than do it myself. I don't know, I find it mesmerising. I love to see it, I watch television, it's lovely to watch. it's nice like watching a film or a dance. It's just so nice. I remember when I was 4 or 5 going to the bakers with my mum to get bread. They sold it fresh in a brown paper bag. As children we would have tea and that would be jam and bread. My father was in the army and we would have to move to different countries. Sometimes we would have the local bread but mostly bread was from the NAFFI, they got it shipped or from a local supplier. My Mum used to see to the students, that used to come to the college in the yard where she lived and she used to do all their baking, dinners, make bread and everything. (St James Church) It was the mens college, mechanics, engineering college and they used to go to the school up the road from where the college was. And me Mum used to do all the dinners. I had me Nanas' bread, it was lovely, it was so light. She did wholemeal, she did seeded and white bread and she used to do the rolls the same, seeded, white, everything. And she did Eccles Cakes. And my Grandma used to say, "Have a piece of bread because it will fill that hole"
I've always enjoyed cooking and have tried baking bread. About 4 or 5 years agos I got a book on 'leven' breads and using wild yeasts. Since then I've been making my own bread and the taste of it is just phenomenal. Supermarket bread just doesn't come close to it, I also think it's a healthier bread. I very rarely buy any other bread, you haven't got an artisan bakery round here to buy proper bread from. If you did it would cost about 3-4 quid. I've got a leven in my fridge that's been there for about 5 years. When ever I want any yeast I just top it up, feed it and it gets going, but it's slower, it's a slower bread. A leven is a live yeast culture. It's made from organic flour, the yeast is already in the flour. Just add water and leave it to ferment. It goes off a little bit and you just top it up with fresh flour and water and after a week youv'e got some useable 'leven' or sourdough. I don't like to call it sourdough as mines not very sour! I don't know if it's the way I've created, it's just a wild yeast. It's lovely it tastes like bread on steroids. It has a taste where as a lot of bought breads don't taste of anything anymore. Even our kids are starting to say supermarket in house baked bread doesn't taste of anything. You can leave the leven for 3 months, feed it again and it'll come back to life. It's quite a fantastic thing, it just goes on and on and on, I've shared it with a few people. I got the recipe from a book by Dan Leopard called 'The Handmade Loaf'. It's a really lovely book, I've tried lots of recipes but I just make them up as I go along now. I just see what I've got left over, chuck it in and see how it goes. I started off spending 2 weeks making a loaf of bread a day, the first 5 or 6 were terrible. I don't know why I just stuck at it and at the end of the 2 weeks they were coming out perfect. It's a slow process, I think we do things to quickly. It fits in better because it's slow, you leave it over night and bake it in the morning. 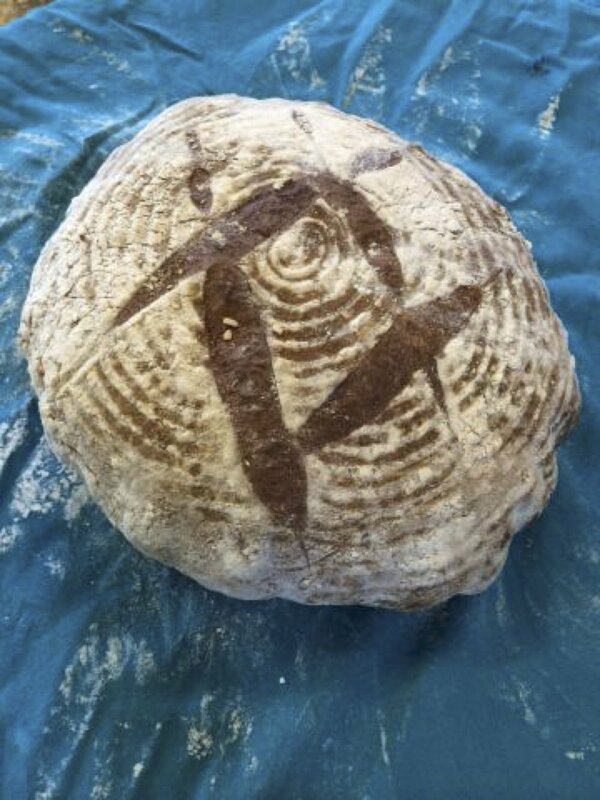 This one (the bread in the pictures) was started this morning and baked this afternoon. It's just about ready now, I had to rush it a bit that's why it's gone all bobbly. This bread is wetter and harder to shape. I proved this one in a Banneton, a wicker basket, that's what gives it the pattern. I mark the top of my bread with a 'hashtag' that's my signature. I think the water makes a difference I have shared this recipe with someone in Cheshire and it doesn't seem to work. It's liek brewing, it's a live yeast and every piece of the jigsaw makes a difference. One of my favourite variaions is to use a cup of left over porridge, it's really filling and hearty it's a bit like a crumpet. I started making my own bread because the stuff you get in the shop is just dreadful, it's such poor quality. During the late 80's early 90's I lived in a house in Northwood that always smelt of bread. We were so poor and we worked out it was cheaper to make our own bread. Every morning I would get up, make my bread, let it rise and bake it, every day. For a treat we would walk into Hanley and get oatcakes. There was a hatch in the wall and you would queue up to get them. I also remember in the early 70's having Harvest Festival. The ladies of the parish would make these enormous loaves shaped like wheat sheathes. Everybody would get together and share them. Right, what I remember about bread is the story of my cousins grandfather, he was a builder, he came from Ireland. It was in Clydebank in Scotland and he was a good builder, built lots of houses and did OK. One of the things he did was build a bakery, a bakehouse and he got alot of children and this was the place for his daughters to work, two or three of them. They used to run the bakery. I don't remember the name of the street but it was up in Clydebank which was a booming industrial area, when Britains' industry was booming. And I have had bread to eat from that bakery, it was white, which is what people used to eat, in Scotland. I only remember the bakeries that were down in the town, and the local bakeries, in Silverdale, there was one. You used to get the bread, lovely bread in the 1950's. You used to go to the bakery and get it yourself. Me Dad was working at the time on one of the bakeries down below here, (High Street) he used to bring the bread home. It was really nice bread in them days. He was in the building trade, probably working on the ovens. You couldn't beat the bread, the taste of it. I still make bread now with the breadmaker, it's still nice to have your own bread. I always liked it, a nice bit of bread. Well, I like wholemeal or brown bread I do, I'm not much for white, we used to get white sliced years ago, but when it came out it was gluey. So you stuck to the bread that you could slice yourself, you know cut slices off it, it's different altogether. We used to go to some pubs and they'd give you that nice thick, toasted with butter on it, it was really nice bread compared with the sliced. I never really liked sliced bread, I don't even have it, unless you are stuck sometime. You stick to your own bread. I like a bit of cheese on it, different things, we have that pate on toast, that's nice. But you can't beat a bit of bread. In 1974 I was going camping in La Havre. I carried on at a junction and forgot to give way to the right. A french man on a bike had to stop and waved his bread stick at me. My worst memory of bread was going up to get bread at the supermarket. It was during the bread strike and I had to miss registration as you were only allowed one loaf per person. My husband works for one of the bakeries at Trent Vale, Mr Kipling. They have bread brought into the factory to help out with ingredients, he's an electrician. Well it's actually the main companies called Premier Foods and the different areas have different names, so this one in Trent Vale is called Manor Bakeries. I must admit as you go along, come off Parkhouse Industrial Estate, as you are coming along the A34 there's the bread factory as you are coming into Chesterton (Embreys), oh the smell from there is just amazing as you are coming into Chesterton. It makes your mouth water. I'm terrible for bread I am. I had to change my bread, 'cos I eat much, I just love it. I had to change I was eating that much I putting weight on with it, so they advised me to change the bread to something a bit more healthier. I have a wholegrain 'cos I can't eat wholemeal it makes me really stodgy so I have have wholegrain. I get it from Tescos' and it's only Tesco that does it. It's £1.35 a loaf, a large loaf and it's only seventy one calories per slice. So yes I love it. I've always been brought up to have bread with every meal. My children will say to you, if I sit down at the table without bread, "Mum are you feeling alright?" "Why" "You have no bread" I think it's one of those gestures, that it filled you up as well so that you didn't have to eat so much of the main meal. They couldn't afford it years ago, really, so they had to stodge everybody up eating bread. In the late 40's through the 50's I grew up in The Westlands and we had brad delivered 3 days a week Monday, Wednesday and Friday. They would would drop 2 loaves on the back door step (it was under cover) and 3 on Friday's. It was from Pickfords bakery, they had a son who would help deliver it sometimes. I'm not sure where the bakery was but I think it's where the oatcake shop is on the A34. We had tin loaves and cobs, we'd eat it with butter and jam on, there wasn't much else around in the early days. My father would have bacon and cheese on it, I didn't have that. In the 50's my uncle had a shop in Wolstanton and he would deliver to us. He got his bread from Birkett and Roberts. Oh yes, Yorkshire bread is the best. I married a Yorkshire man and went to live up there, his mother taught me to make bread. She said, "Now you can make bread you are as good as Yorkshire girl", now that was a compliment! When I was 9 years old we lived next door to a lady who was 95 my mum would tell me to pop in to her on my way home from school. She would ask me if I would like to have a piece of bread. The first time she asked me I said 'yes please' because I was hungry, as you are having walked home from school. She got a loaf out, held it upright and buttered the top, then she cut the bread very thinly, the thinnest piece of bread I've ever seen. She put it on a plate and put some home made jam on it. I often wished I could have 2 or 3 slices of this, if not more, but you only ever got one slice. I think this came from the war years because she was around in the First and Second World War and was still being careful with food. I remember me neighbour use to make bread, it was like a bloomer. She let it rise next to the fire, for quite a while....over night I think. I never watched her make it, I wish I did. My mum and dad had a shop in Park Hall Street, Longton, they sold bread and it was four and half pence. I was born in 1933 and we moved into that shop when I was five, they sold everything. As a kid we would have chip butties on a Friday because my dad didn't get paid until Saturday. You could get a loaf of bread, half a dozen eggs and a bag of chips off the milkman and you didn't have to pay him until Saturday. That was always Friday night tea as we didn't have any money left. We only ever had white bread, now I only ever eat brown. I bought a supermarket loaf yesterday. I don't know what they put in it. I read the label, you know, it was like the Gettysburg address. All I put on mine is flour, water, salt, yeast and a drop of olive oil.